China Unicom has reported a mixed back of results for the first six months of 2016, with strong performances relating to 4G, data centres and ICT, however profit declined by 79% year-on-year. On the more positive side of things, the data centre business unit and ICT division grew by 38% and 34% respectively when compared to the same period in 2015. The healthy performance here seemingly mitigated the drop off in voice revenues, which for the fixed line was down 11.9% and for mobile 14.7%. The OTT competition is seemingly having quite an impact on China Unicom’s business, as it is having on the smartphone industry worldwide, though WeChat, the country’s most popular OTT instant messaging service is growing at a healthy rate. This impact is unlikely to be lessened over the coming months. In the mobile business, 4G make positive strides throughout the six months, accounting for roughly 61% of the new subscribers accumulated throughout the period. The number of subscribers is one of the areas which the team demonstrated a turnaround from H1 2015, turning a net loss of subscribers into a net gain of 8.39 million subscribers over the first six months. The total number of subscribers now stands at 260.7 million, of which 72.42 million are 4G. “Currently, the Company is undergoing a new stage of transformation, and facing both opportunities and challenges,” said Wang Xiaochu, CEO of China Unicom. “We are more than confident in our future development. The Company will persist in its strategic focus and further deepen implementation of Focus Strategy, step up the improvement of capabilities in marketing, network support, operations and management. The Company aims to drive continuous improvement in operational performance with continuous enhancement in its basic capabilities, and speed up the turnaround in financial performance.” The improvements are demonstrated in the graphic below. In terms of the more negative side of the earnings, both revenues and profits declined year-on-year for the six months, the first time the business had seen an annual decline since 2010. Profit, which demonstrated a decline of 79%, was the lowest interim profit for the company since 2000. Although these numbers would not be considered ideal, they should not be considered surprising as the profit does match numbers given by the company in its profit warning which was filed at the end of June. Due to this warning, it would appear the slip has not had much of an impact on China Unicom’s share price. The decline itself has been pinned on additional expenditure, as opposed to competition eroding revenues. The team pointed to larger sales and marketing campaigns, as well as numerous upgrades on network infrastructure to ensure competitiveness over the coming months. The declines are expected to be recouped over the remainder of the year and into 2017, as the team realize the benefits of the marketing campaigns and network upgrades. 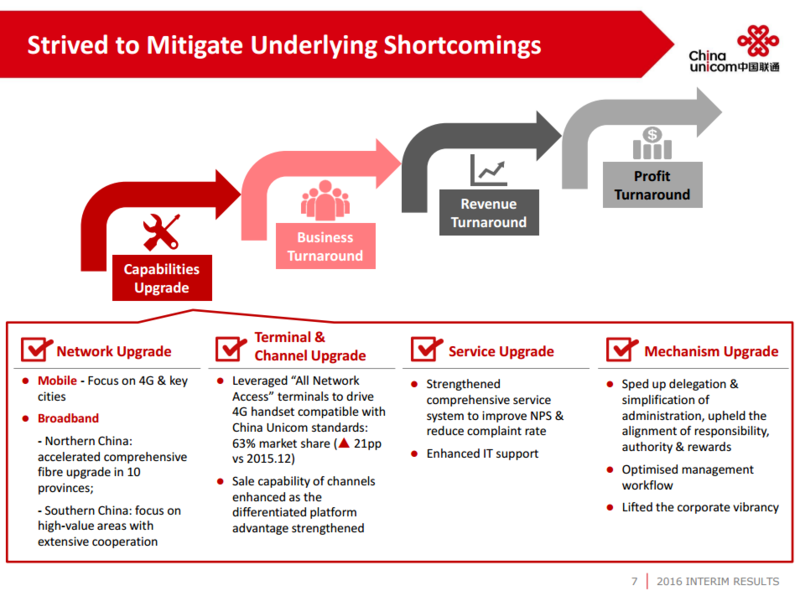 Not wanting to miss out on contributing to the host of 5G partnership announcements, China Unicom have pitched in with its own alongside the earnings call. China Unicom and ZTE have signed a strategic cooperation agreement on joint 5G and IoT projects, with the aim to ‘foster a sound ecosystem and promote sustainable development of the industry’.